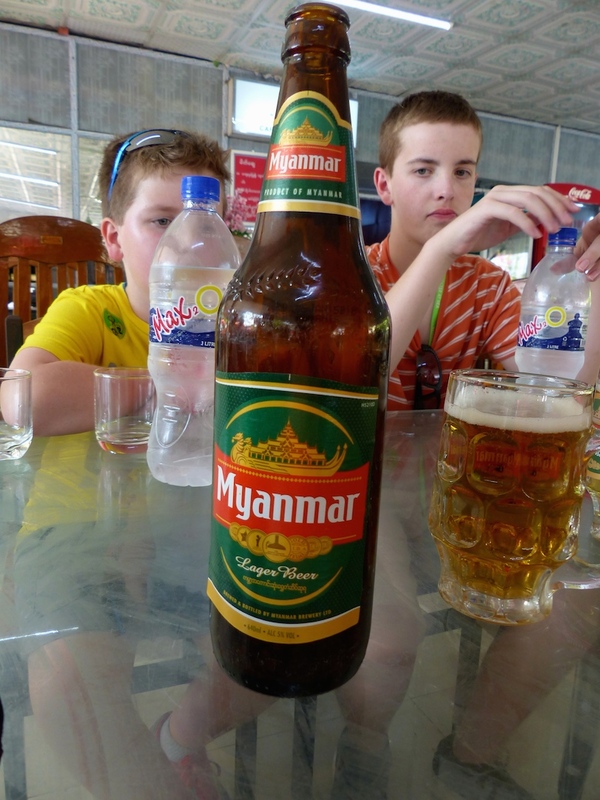 I usually post once we’ve left a country, but we are having a lazy day, resting on the ship today, after a long hot day in Rangoon, Burma yesterday (I like the old names better, but as of 1990 the city is actually Yangon and the country Myanmar). The ship’s port is a 90 minute bus ride away from the city, over bad roads, and we leave in the middle of the night tonight for a flight up north to Bagan (still Burma) so we thought we’d take it easy today. Yesterday was awesome. Hot, dusty, crowded, yet still seemed a lot more laid-back and peaceful than some recent stops. Rangoon has 5 million people, so it’s crowded, but there was a lot of space to ramble around in, and plenty of shady spots to find to get out of the sun. The Shewdagon Pagado was our main stop yesterday. We had a long walk from the shuttle to get there, and stopped at an interesting market along the way. Dan and I bought loties (I am positive I am misspelling this word) which are long wrap-around skirts, perfect for the heat here. And yes, Dan bought the men’s version too. Most of the local men wear them, and they are a lot more comfortable. I even got to pick my fabric and have mine custom sewn in 5 minutes (and for $9). I will include as many pictures as the internet connection I am using will allow. But honestly, pictures do not do this place justice. 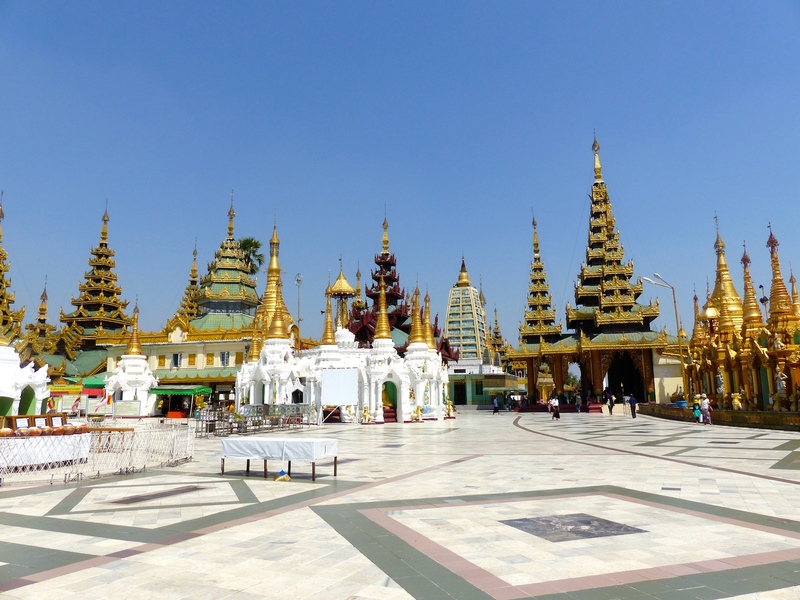 The gold is staggering, and the scale of the architecture is immense. So many Buddhas! This entire complex is immense – we spent the afternoon inside the gates. Joe is a bit of a celebrity most places we go in Asia, and Burma was no different. He gets a lot of attention from older women who smile and want to touch him. Here in Burma, women and children wear a sort of cream they make (pronounced like naqqa) on their cheeks and elsewhere on their faces. It is primarily for sunscreen and cooling, but also is cosmetic. As Joe has a tendency to get very red in the face when he’s hot, we had women gesturing to us yesterday, indicating that he needed to have some naqqa on – we think they were worried he was sunburnt! 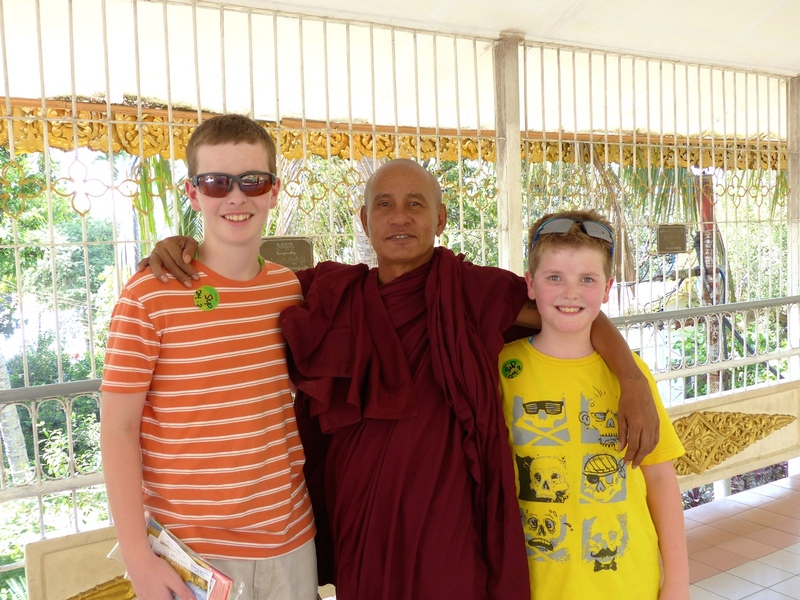 Even the monks like him – one actually insisted (through gestures) that we should take a picture with him. I am so used to trying not to inadvertently take pictures of locals (I worry I will offend someone) this was very interesting. He then wanted to see the picture. It’s a cute one, so I had to include it here as well. 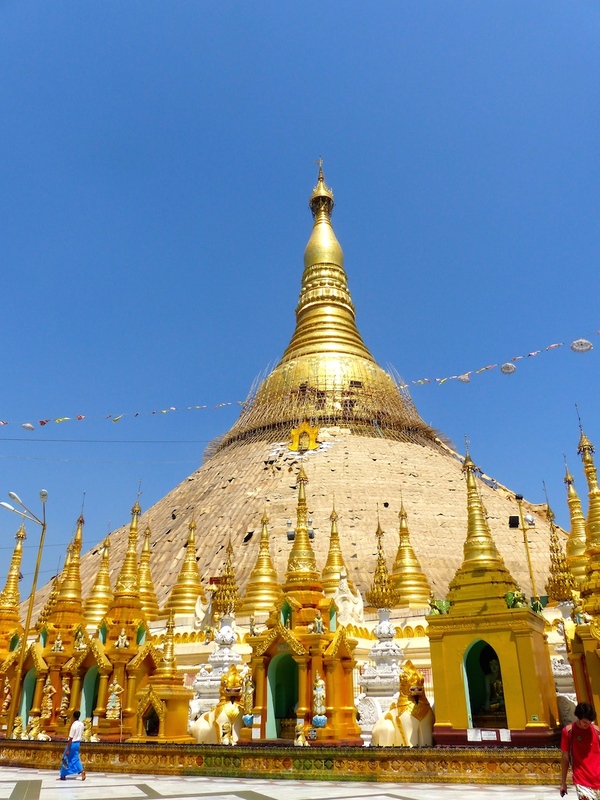 On to Bagan tonight, where there are upwards of 2500 pagodas, and the whole town is a protected archaeological site!